On 4 September 1916 Lieutenant-Colonel Duncan Frederick Campbell died at Southwold, Suffolk, after an attack of pneumonia. He had been severely injured by the explosion of a mine in France a few weeks earlier. As the war on the Western front intensified with the beginning of the Somme offensive in July 1916, Campbell was the first of five MPs to die within three weeks. Campbell was already an experienced soldier before the First World War. Born in 1876 in Toronto, Canada, where his father Archibald was a barrister, he graduated from Trinity College (later part of the University of Toronto) in 1898. He moved to Britain that year to join the Lancashire Fusiliers, and served in South Africa with the second battalion during the Boer War. After being wounded in his foot, he recuperated on the floating hospital set up by Lady Randolph Churchill, before returning to the fray. Mentioned several times in dispatches, he received the Distinguished Service Order in 1901, and was also awarded the Queen’s medal with six clasps. Continuing his military career, Campbell served in Malta, Egypt, Gibraltar and the West Indies, and transferred to the Black Watch (Royal Highlanders) in 1908. He had married in Canada in 1902, but made his home in Britain, where he was selected to contest Mid-Lanarkshire for the Conservatives at the 1906 election. With the Liberals winning a landslide across the country, Campbell suffered a resounding defeat. He was equally unsuccessful at Paisley at the January 1910 election, and lost by 250 votes at North Ayrshire that December. In December 1911, the sitting Liberal MP, Andrew Anderson, had to seek re-election at North Ayrshire following his appointment as Solicitor General for Scotland. Campbell fought an energetic campaign against him. The main election issues were the Liberal ministry’s National Insurance Act (which provided a contributory scheme of insurance for sickness and unemployment) and Irish Home Rule. Campbell protested that the former, whose details he criticised, had been passed with ‘undue haste’ to make way for the latter. He defeated Anderson, describing his victory as ‘a very serious blow to the Government’ and a warning against their ‘rash precipitancy’. Campbell had retired from the Black Watch in 1910, but joined up at the start of the war in August 1914, and was attached to the 2nd Gordon Highlanders. He was wounded during heavy fighting at Ypres that November. Despite being hit in the shoulder by shrapnel, he carried on leading his men in the successful capture of an enemy trench, but was then struck by another shell. His left arm was so badly injured that he only narrowly avoided amputation while recovering at a Paris hospital. He returned home to recuperate, spending time at his residence in Ayrshire, where he was involved in recruiting work and raising war relief funds. a man … I have never supported before, and who I see no reason to support for his past history, but who I see every week deserves support for the honest and businesslike endeavour he is making for the carrying out of this campaign. I would leave that task to myself, even though I have the use of only one arm, having lost the use of the other one in a task which the hon. Member for Hanley would never dream of attempting or daring to risk. Campbell regained sufficient use of his arm to return to the front early in 1916, serving in Belgium. Promoted to lieutenant-colonel in March, he became commanding officer of a battalion of the Duke of Wellington’s (West Riding) regiment, with whom he was serving in France when he sustained the injuries which led to his death. Survived by his wife and children, Campbell was buried in Kilmarnock. He is also commemorated at the University of Toronto on the Soldiers’ Tower. You can read the rest in our MPs in World War I series here. 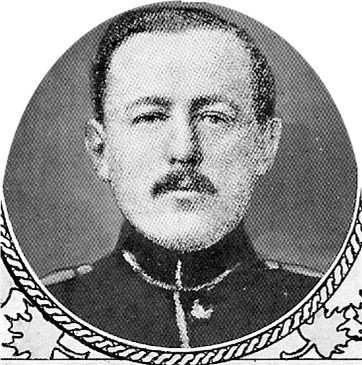 This entry was posted in 19th Century history, 20th century history, military history, World War I MPs and tagged Ayrshire, David Lloyd George, Home Rule, Lieutenant-Colonel Duncan Campbell, R. L. Outhwaite, Somme. Bookmark the permalink.